Another warm, muggy day greeted riders and fans for the second day of the Grand Prix competition. Canada’s third team member to compete, Megan Lane, unfortunately did not have the test she envisioned with Zodiak MW. The 14-year-old KWPN gelding, competing at his first major international event, entered the arena looking like a seasoned pro, but things quickly unravelled as he figuratively and literally put his foot down in the early piaffe/passage sequences, which were essentially non-existant. He gradually settled and performed up to his substantial level of talent and by the final centreline was piaffing and passaging magnificently. Unfortunately by that point the damage was done; their score of 60.901% placed them second-to-last in the field of 76 and they became the team drop score. She described parts of the test she was pleased with. “The twos are always a highlight for him; the pirouettes were amazing; the ones were also very good. He has an amazing extended canter, too. The extended walk was really, really good, for him in this big environment. With all this action going on, the walk has been really tricky for a lot of people this week. 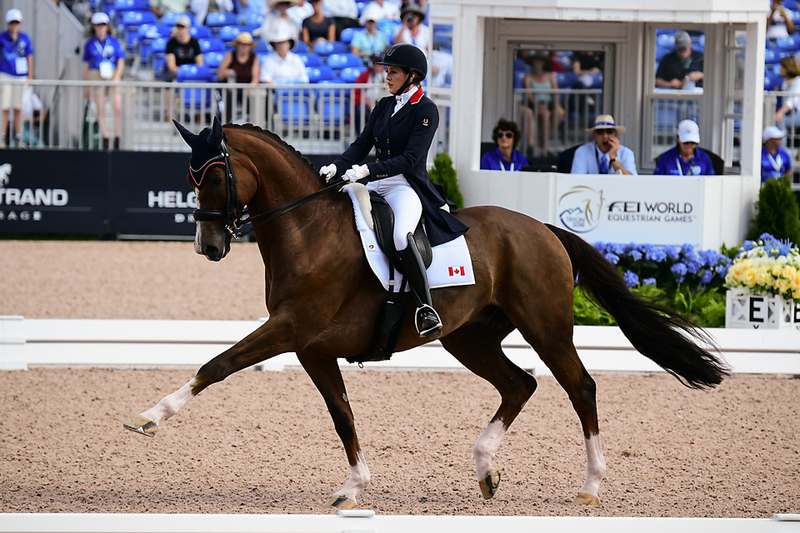 All In, ridden by Brittany Fraser-Beaulieu, the last to go for Canada, stormed into the arena like he owned the place and did not let up for a second. Their lovely test earned 70.016% and 33rd place overall. Fraser-Beaulieu described their performance. “I would say right up until I had that little mistake in the zig-zag he felt absolutely amazing. There’s a lot of atmosphere in there and he was totally with me,” she said of the 13-year-old KWPN gelding she has owned since he was five. With the incredible heat and humidity, she explained her pre-ride plan. “I decided today to have a really short warmup ‒ maybe twenty-five minutes. He’s very big and he can tire quickly. We were in training camp as of September first in South Carolina, so he’s a little bit used to the heat now. Unfortunately, no Canadian riders placed in the top 30, the cut-off point for tomorrow’s Grand Prix Special. To the delight of the crowd, Team USA (Steffen Peters/Suppenkasper, Adrienne Lyle/Salvino, Kasey Perry-Glass/Goerklintgaards Dublet and Laura Graves/Verdades) grabbed the silver medal, while Great Britain (Spencer Wilton /Super Nova II, Emile Faurie /Dono di Maggio, Carl Hester/Hawtins Delicato, Charlotte Dujardin/Mount St John Freestyle) took the bronze. The Canadian team finished in 11th spot. One of the most highly-anticipated rides of the day was Charlotte Dujardin and her flashy new ride, Mount St John Freestyle. They scored 77.764% and led the Brits to their bronze medal finish. “I’m really, really proud; a three-star event and nine years old. She’s never been in that sort of environment before,” she said of the relative youngster. “She felt brilliant; when we went in everybody clapped and she kind of rose – she loves the atmosphere.